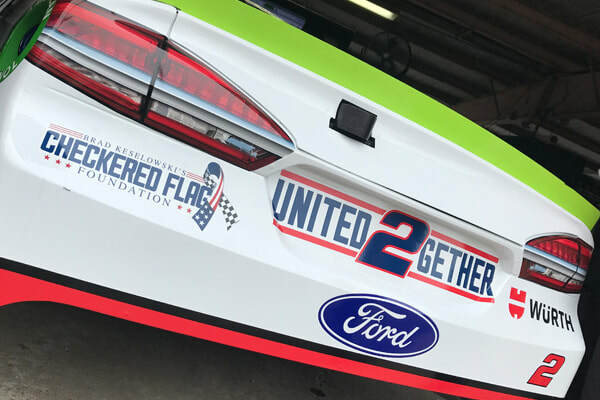 In mid-September, Keselowski announced his Checkered Flag Foundation would provide support to first responders in communities affected by Hurricane Florence. Brad and his wife, Paige, who is from Eastern North Carolina, have made two visits to affected areas so far, including stops in Jacksonville, Swansboro and this past week in New Bern. Due to days of record-breaking rainfall delivered by Florence, flooding is the primary concern in affected areas. Teams of first responders are working overtime providing water rescues and helping ensure the safety of residents in the impacted areas. Wurth agreed this week to carry the “United2Gether” logo on the TV panel of Keselowski’s No. 2 Ford in Sunday’s Gander Outdoors 400 at Dover (Del.) International Speedway. At the company’s hospitality location on Sunday at Dover, they will be selling beer mugs with 10 percent of the proceeds going directly to the relief fund. Wurth will auction off Wurth/Checkered Flag Foundation/Team Penske items to raise money plus collecting donations throughout the day. Keselowski will stop by the hospitality location on Sunday prior to the race to personally thank Wurth’s executives for their assistance. The Wurth Group is a leading supplier of high-quality automotive parts, cabinet supplies and industrial fasteners servicing over 200,000 customers across the U.S.
To view this article as it appears on Motorsport.com, click here.